The best motorcycle shop period! 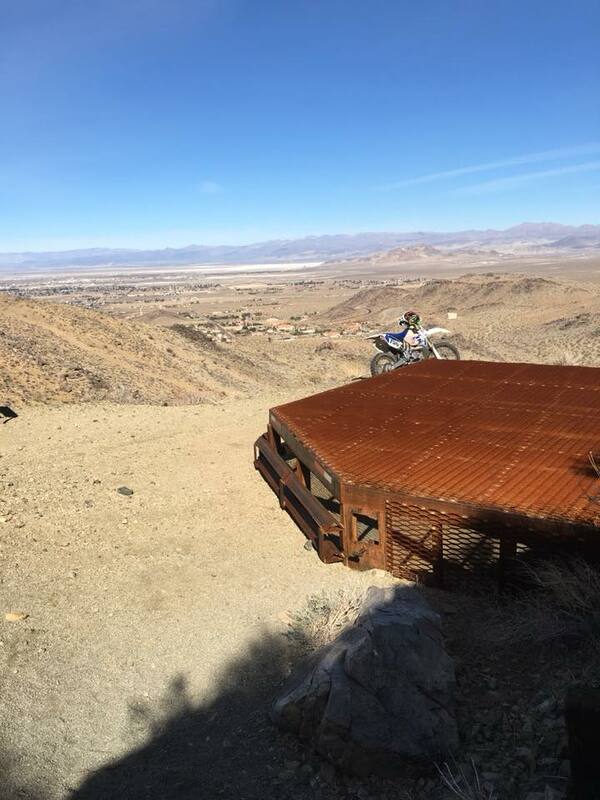 Hey everyone, this is a little late in coming but I wanted to give a race report about the National Hare and Hound Associations Round 1 race in Spangler Hills California. 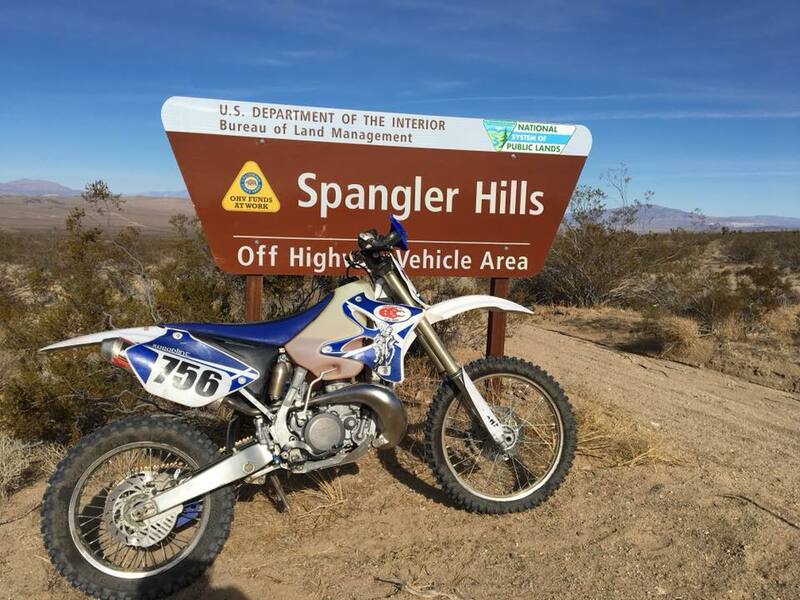 First off, Spangler Hills is about an hour and a half North and West of Barstow, near the little military town of Ridgecrest. It is a really beautiful part of the Mojave desert and out in the middle of nowhere. 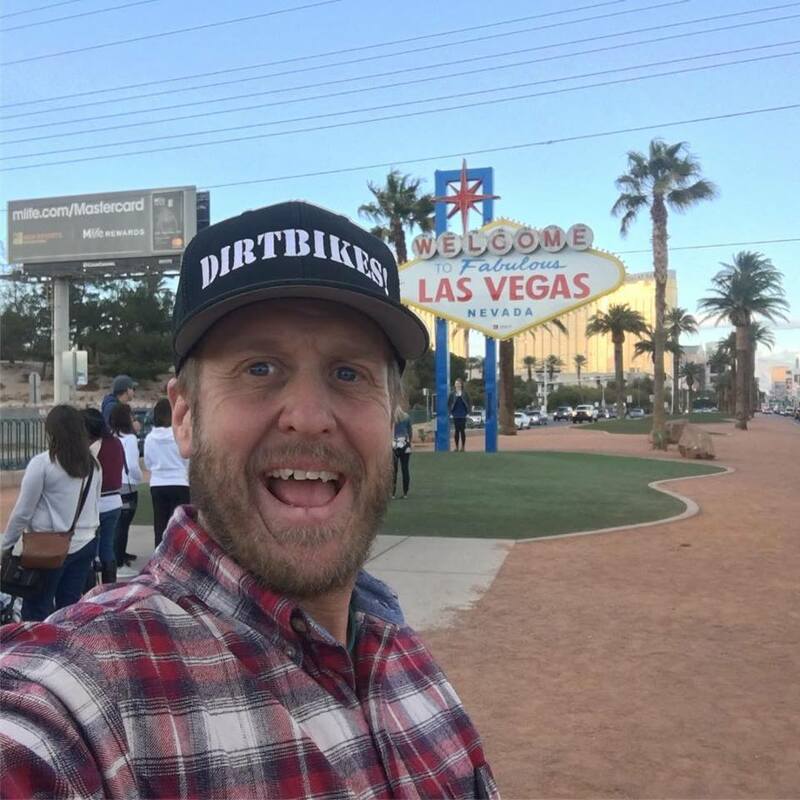 Which is the perfect location for a desert race. The drive from Montrose takes about 11 or 12 hours but it passes quickly with 80mph speed limits all the way across Utah. 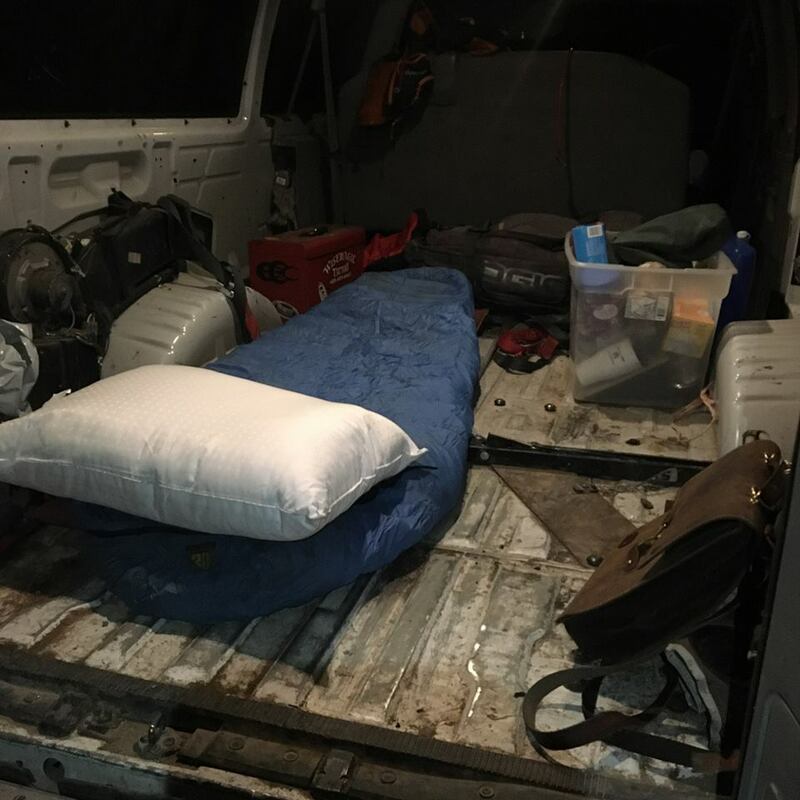 I pulled into the race site just after 9:30 pm on Thursday night and set up the inside of my van for sleeping. The night was pretty darn cold, especially for California but the sleeping was good and I woke up as the sun was coming up and made some coffee. After breakfast, I geared up and got ready to ride. I had just rebuilt the entire motor of my YZ250 because of a broken piston skirt just days before. I had started it but only put about 2 minutes on the engine. So I headed out into the desert easy to break the girl in. As I got some heat into the engine I decided to wick it up a bit since in 2 days I would be pinning it wide open. As I got the revs up, I noticed a funny sound coming from below me. I stopped and began to freak out. I had been in a hurry when I built the motor and I began to wonder if I had forgotten something. Crap!! 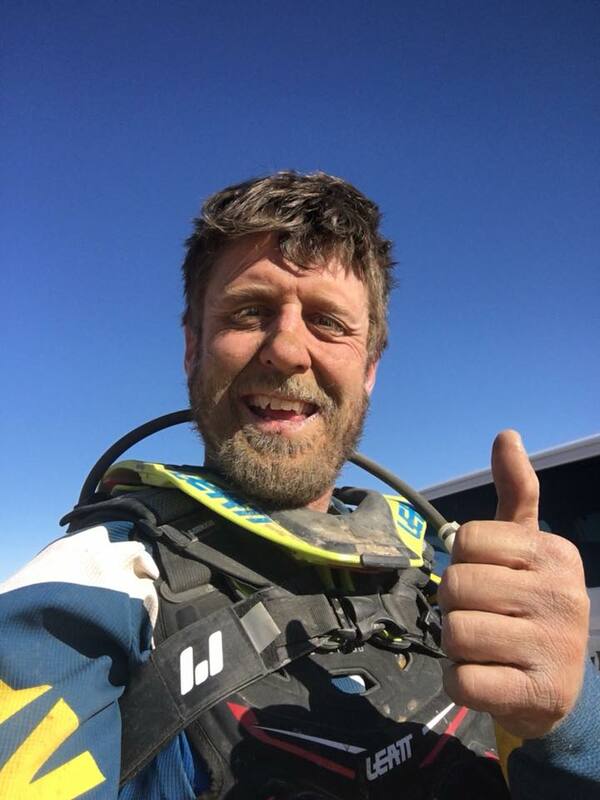 As I sat out in the desert I thought to myself, "Well, I'm here and I might as well see if it's going to break now, instead of waiting for the race." So I fired it back up and pinned it! 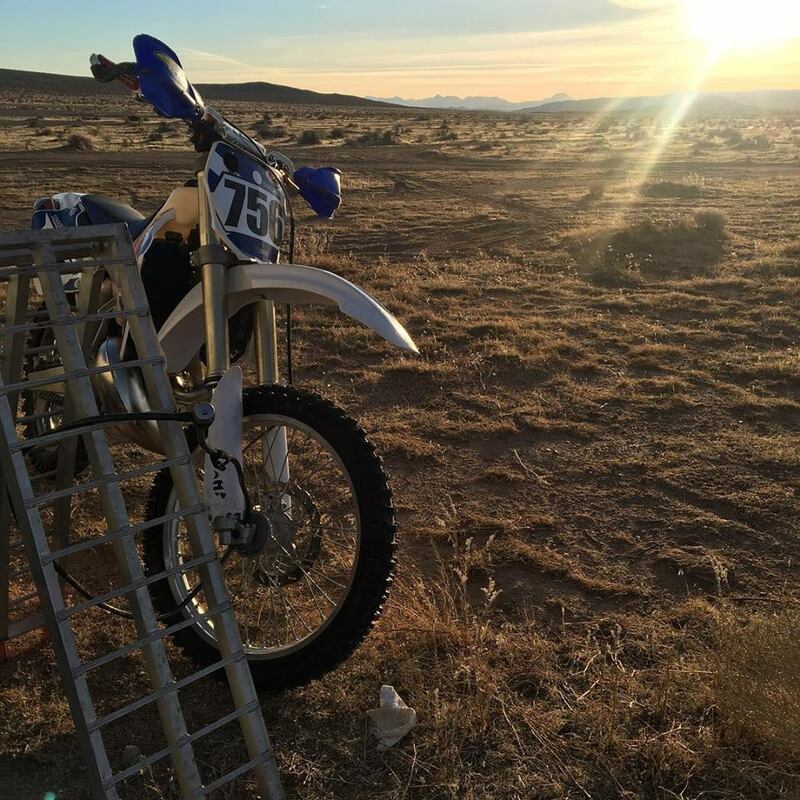 As I ripped through the desert the bike ran perfectly but at a certain rpm, it would rattle just a tiny bit. I put it out of my head and had a great ride. The desert is so pretty and the weather was perfect. That afternoon I met up with Travis from TBT racing and hung out with him for most of the evening. Travis and I have been "friends" on Facebook for a while but have never met in person. I absolutely LOVE the motorcycle community. Even if you really don't know someone, if they are a dirt biker then you are already friends!! Travis was super generous and said he would provide a pit for me during the race. I headed back to camp for dinner and some sleep. I still had another free day before the race to check the bike out and get some practice in. The next day was more of the same. 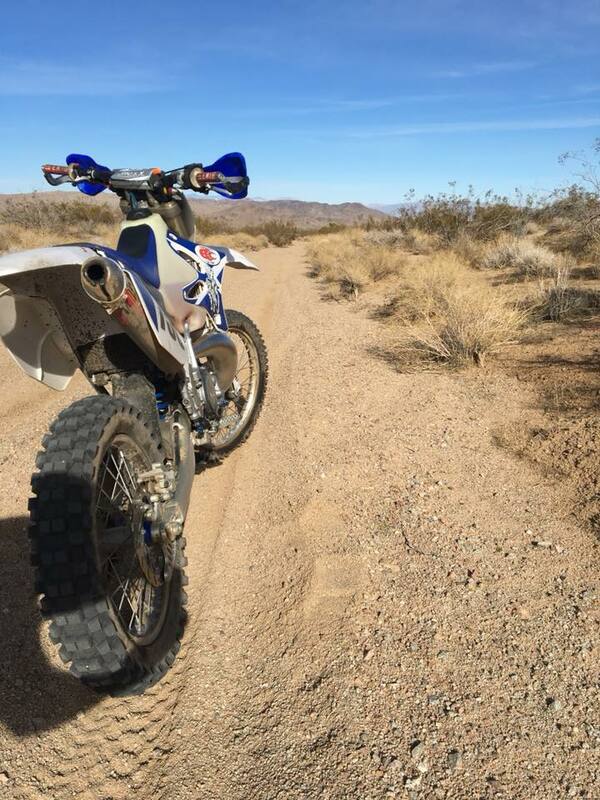 Perfect weather and a super fun ride in the desert. It is so cool out there because you can just go and explore all over the place. I had a blast and saw some really cool stuff. I finished the ride for the day and finally figured out what was going on with my bike. After the motor rebuild I had installed a new aluminum skid plate and one of the bolts on the bottom didn't line up so I left it out. Well that allowed the skid plate to rattle on the aluminum frame at just the right rpm and made a noise that sounded like things coming apart. WHEW!! I could relax and just race. I got a great night's sleep and got up early to get ready to race!! After breakfast, I headed to the start line to check out the bomb run. The bomb run is the first 1.5 miles (that distance changes every race) of a desert race that is essentially a high horsepower free for all! It is the only part of the course you are allowed to pre-run so I rode it twice to check it out and see if there were any big hazards. After a good look at the bomb, I headed back to the start and picked a spot. The start of a desert race is one of the most exciting things on earth. On this day there were 400 people at the start line, all racing for the same point 1.5 miles away. When they raise the banner, everyone kills their engine and you have at least 1 minute before it drops. I don't know about you but I can't accurately count a minute in my head so as soon as it goes dead silent I put my foot on the kick starter and waited. The tension is out of control. 400 adrenaline freaks are dead quiet, waiting to race. There is nothing like it. The banner dropped and BAM, we were off. I am not a good starter so I was immediately in a ton of dust and could barely see. The first 5 miles were basically riding by braille in 5th gear. As the race continued I was able to find my way around some people and the field started to spread out. The dust abated a little and I started to find my groove. In the second half of the first loop we got into some rocks and I made some time on the other riders. 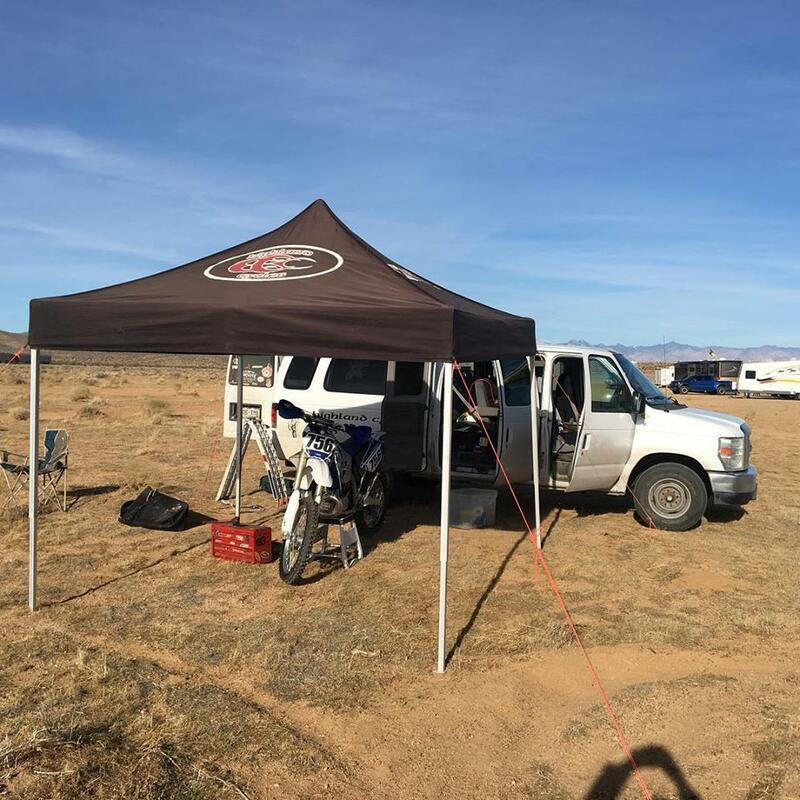 The first loop was 40 miles of fun, fast riding and I came into the pits in 1st place in my class. I couldn't believe it. I was expecting to be a lot slower but I was stoked. Travis got me some gas and I was back out. Second loops of desert races are always harder and this one was GNARLY! The first few miles were fast and easy and then all of a sudden it got REAL! The first canyon I came to, I passed a grip of guys struggling by jumping off my bike and just bull-dogging it off to the side through some boulders. I jumped back on and pinned it. The first real rocky hill climb came quickly and it was strewn with downed riders. I took one run at it and botched it. After a quick run down to the bottom, I launched back up and cleaned it. I was stoked! As I fought through the rocky second loop I caught up to a guy who I had met at Travis' pit. Justin was just ahead of me in the gnarliest section of the race. It was a heinous downhill canyon with massive boulders and big drops. I caught Justin and we both made our way down. From here our battle would begin. He would gap me in the faster stuff and I would catch up in the hard bits. After miles of back and forth I caught up to him near the end of the race. We were both beat down and struggling to find the drive to push hard but I managed to dig a little deeper and passed him. After that pass, I was fired up. I pushed hard to the end and crossed the line in 1st place. It was in the Senior B class which doesn't sound like much but trust me, those dudes are FAST! I couldn't believe it! I really didn't expect to do so well and I was elated! I want to give a massive thank you to the District 37 people, the Desert MC's and the National Hare and Hound Association for a great race! After packing up and getting my trophy I began the long trip home. But somehow winning makes the drive easier! I can't wait to go back and race another Hare and Hound and I hope I can get some folks from around here to join me. It is one of coolest, oldest and most exciting kinds of dirt bike racing around! Thanks for reading, I hope you enjoyed it as much as I liked writing it. If you are interested in my personal blog you can click the button below. 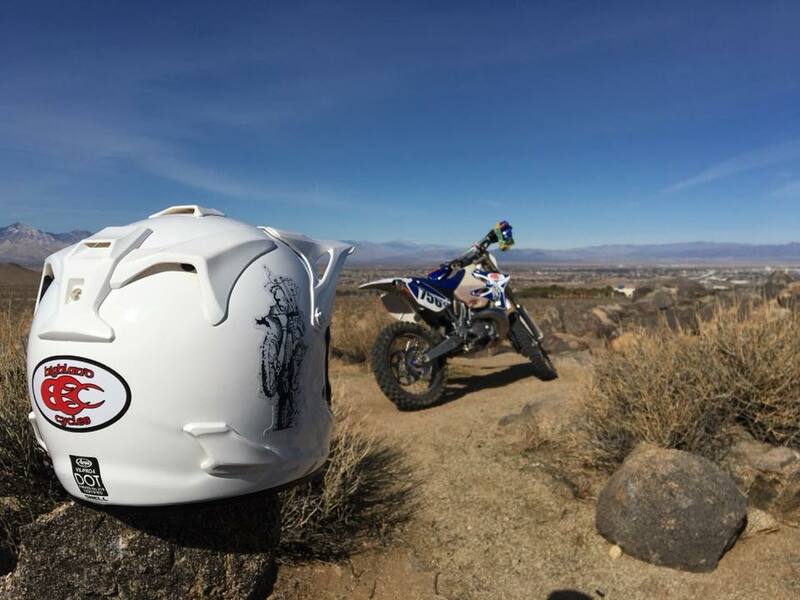 Highland Cycles OHV Tag Sale Day!